I made it into my stamp room again last night *smile* It is so nice to get back to my regular routine and enjoy my hobbies again!!! I have a pretty busy weekend...since Mike and I have been sick, we didn't get to celebrate his birthday last weekend, so now that he is starting to feel better, we will celebrate on Sunday. I am also heading to Connecticut next week to visit my mom, so lots to do to prepare for that (have to make sure Josh and Mike have some easy meals lined up so they don't starve, lol!). 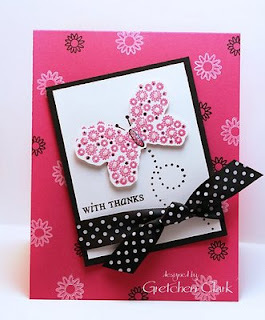 I needed to make a thank you card, so decided to pull out my Butterfly Kisses stamp set and paired it with a Raspberry Fizz and Black color scheme. It is hard to see from the photo...but I added Crystal Effects and Dazzling Diamonds glitter to the butterfly...it needed some bling! Enjoy your weekend...thanks for visiting!!! Hi Gretchen, what a beautiful card! Love the color combo, and here in AZ it does feel like SPRING! I am giggling at the time of your post. 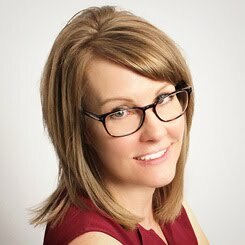 I met my match! I am a night owl, too! Thanks for sharing your amazing creativity!